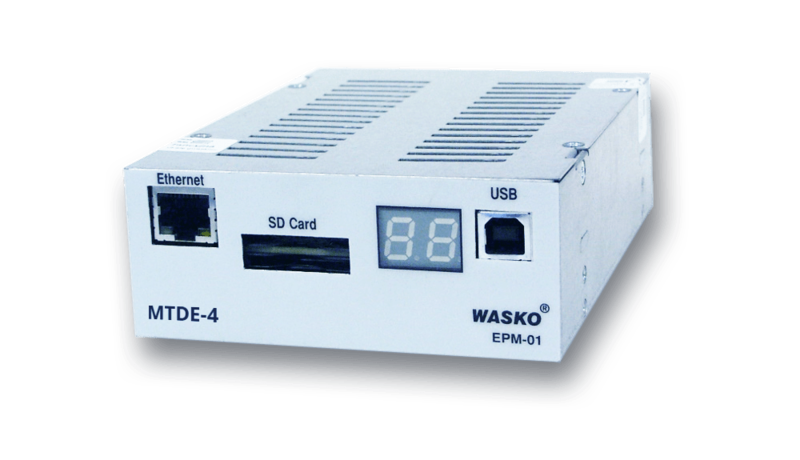 EMULATOR OF MASS MEMORIES MTDE-4 - WASKO S.A.
Emulator of magnetic mass memories MTDE-4 is an electronic device addressed at telecom operators possessing digital telephone exchanges, for the purpose of simplification of service connected with data transmission. It replaces magnetic drives applied on telecom exchanges both for transmission of billing and system data. Due to application of modern electronic systems and specialist software MTDE-4 is suitable for emulation of drives making use of record on magnetic tapes and magnet-optical discs. From the point of view of the system in which it is installed the emulator is visible as a standard physical drive e.g. magneto-optical drive, streamer or tape drive. MTDE-4 behaves identically to an original drive. The device is equipped in three connectors: SCSI, Ethernet and supply. SCSI and supply connectors serve direct connection in the place of emulated physical drive. Ethernet connector serves connection of controlling computer in which data read from an exchange or data to be recorded on an exchange are collected. On the controlling computer software is installed enabling emulator handling similarly as if SCSI standard device was handled (e.g. providing an appropriate size disc, disc diagnostics, recording data on the disc, reading data from disc, disc removal). All operations are conducted on so called virtual medium. A virtual medium is a part of capacity of controlling computer hard drive, which serves storing information sent to/from emulator. Data saved on the virtual medium may be provided to other system by means of IP network or in any other way, according to the Client requirements.